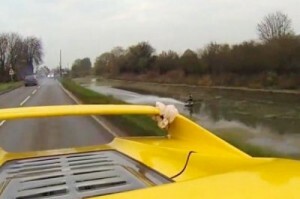 This is the moment a teenage wakeboarding champion was pulled up a river at 84mph – by a bright yellow Ferrari F50. Jorge Gill (19), the two-time European wakeboarding champion, hurtled along the river as the Ferrari hit what claims to be speeds of 84mph. The driver of the 202mph Ferrari – a mid-90s motor regarded as a road-legal racing car – then accelerated off on the open road as Jorge held on for dear life. This video was shot in Lincolnshire by TaxTheRich, a secretive group of petrolheads known for making extraordinary car videos. In the past they have thrashed a Rolls-Royce around a country estate while also taking a Ferrari Enzo rallying. The Tax The Rich YouTube page only has 15 videos on it, but they have racked up a staggering 34.8 million views. But this is the first time a Ferrari has taken a back seat in one of the group’s videos. The stunt, which took place on and next to the Maud Foster Drain, could be investigated by police as the speed limit on the single-carriageway road is 60mph. Jorge, from North London, became an internet sensation earlier this year when he wakeboarded through a flooded car park in Guildford. The adrenaline junkie, who is also a five-time national champion, had the idea for his latest stunt while travelling through Europe. He added: “I was a little nervous beforehand. Normally I do around 20mph but for this I was going a lot faster. We had a few warm-ups at lower speed and it was a bit scary when you hear the Ferrari’s engine. It is dangerous, but you have to put forget about the dangerous side until afterwards.